Libya - The UN Migration Agency (IOM) has launched an online consular service to make the consular process easier to access and navigate for vulnerable migrants hoping to return home. The first online consular session was conducted on 5 June via Skype in close cooperation with the Ghanaian Embassy in Tripoli. The remote consular service connects the migrant to his or her embassy’s representative online in order to receive the necessary information ahead of IOM’s Voluntary Humanitarian Return service. Thanks to the service, one Ghanaian migrant in the Shahat Detention Centre in the city of Shahat, 250 km from Benghazi, was able to receive travel documents. The session was organized by IOM’s team on the ground in Benghazi and the consular staff of the Ghanaian Embassy in Tripoli, who support IOM’s new remote consular initiative. “We thank the Ghanaian Embassy for their cooperation and flexibility. We hope that more Embassies will come on board this new innovative initiative,” explained Ashraf Hassan, IOM Libya Project Manager. Recognizing the vast demand for the Voluntary Humanitarian Return, IOM identified a need for a more functional approach, not only optimizing the duration of the travel documentation process, but also reaching a larger number of vulnerable migrants. 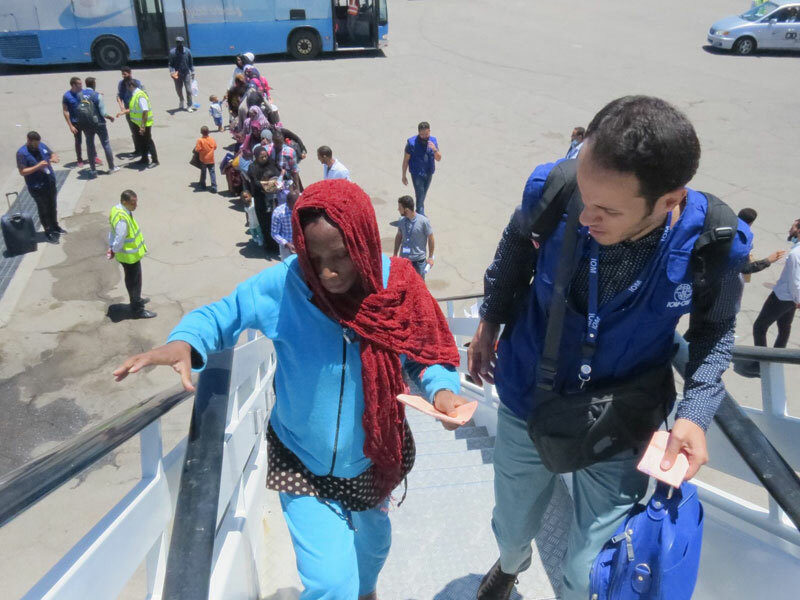 IOM conducts field visits with the relevant embassy representatives to migrant detention centres in Libya to facilitate the procedure of issuing proper travel documentation to migrants preparing for voluntary return to their countries of origin. These consular visits require significant coordination with the detention centres, local authorities and embassies. These visits are also only possible within Tripoli and with some difficulties in Gheryan (90 kilometers south of Tripoli) and Misrata (around 200 kilometers east of Tripoli). They are not possible in other major cities such as Al Zawia, Subarata, Surman, Benghazi and Sebha, where IOM has identified a high demand among migrants to return home. This operational constraint has notably affected IOM’s assistance to stranded migrants as up until now these visits have been crucial to the voluntary return operation. The longer they get delayed, and sometimes cancelled due to security or operational challenges facing the embassies, the longer migrants are detained in the detention centres or stranded in urban settings in Libya. This new online service will save both embassies and IOM time and resources that are required in coordinating and arranging the escorted field visits of embassy personnel to the detention centres, as well as ensure that they can reach migrants outside of Tripoli. “Due to security issues and no means of transportation, migrants in remote areas have difficulty getting their papers processed. We hope this service will give many more stranded migrants an opportunity to return home, if they wish to do so,” Ashraf Hassan added.